Europe's lunar satellite, the Smart 1 probe, is about to end its mission by crashing on to the Moon's surface. It will be a spectacular end for the robot which has spent the past 16 months testing innovative and miniaturised space technologies. Smart 1 has also produced detailed maps of the Moon's chemical make-up, to help refine theories about its birth. The impact, which will be watched by professional and amateur telescopes, is set for 0543 GMT (0643 BST) on Sunday. The robotic craft should come down on the nearside at mid-southern latitudes, in an area called the Lake of Excellence. 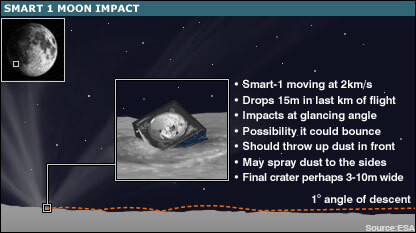 With an impact speed of about 7,200km/h (4,500mph), even at an expected glancing blow of just one degree to the surface, the probe should meet a sufficiently violent end that astronomers can follow the event from Earth. 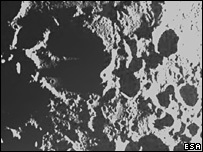 It is possible telescopes will see fresh lunar "soil", or regolith, kicked up in the crash. They may even detect a thermal flash as volatile materials on the probe melt some of its structure. "Smart 1 will die, for sure, and as its 'father' I must confess to feeling a little sad," said Professor Bernard Foing, the mission's project scientist from the European Space Agency (Esa). "But it can live on in the sense that we are able to take its legacy forward - to analyse its scientific data and to carry the experience of the team into future missions." A fleet of spacecraft - both orbiters and landers - are now expected to visit the Moon in the next few years. This train of robotic explorers will culminate in astronauts returning to the lunar surface for the first time since the Apollo missions, probably in 2020. Smart 1 was launched in September 2003 as a technology demonstrator. It became Europe's first space science mission to use an ion engine instead of chemical combustion to reach its destination. The system draws power through the probe's solar wings and then uses this energy to propel the spacecraft forward by expelling charged particles of xenon. It was highly efficient, covering 100 million km in a series of looping orbits and using just 60 litres of "fuel". "That's remarkable when you think about it - it's the same volume of fuel as you'd put in the tank of a car; and we went all that way," said Smart 1 scientist Professor Manuel Grande of the University of Wales, Aberystwyth. An ion engine will now be fitted to the majority of Europe's future spacecraft, such as the Bepi-Colombo mission to Mercury. Professor Grande himself has been principal investigator on one of Smart's miniaturised instruments: the compact X-ray spectrometer known as D-CIXS. It has made mineral maps of the Moon's composition, looking at the distribution of calcium, magnesium, aluminium, silicon and iron. 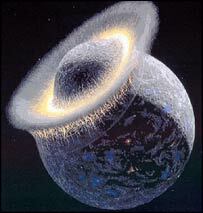 Knowing the absolute abundances of these elements will help to refine theories for the Moon's formation. These describe the satellite emerging from the debris thrown out from a mighty collision between Earth and a Mars-sized body billions of years ago. "Like everything else on this spacecraft, our X-ray technology was smarter, smaller and lighter than anything that has been flown before," said Professor Grande. "The instrument weighs about five kilos. Instruments that have tried to do this before have weighed 10 times that." 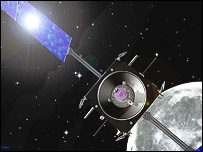 D-CIXS has proved so successful that an enhanced version (called CIXS) is now under construction to fly on the Indian Chandrayaan mission to the Moon in 2007/8. Smart 1's camera AMIE has also added greatly to our understanding of the Moon. 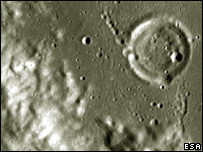 Previously, the best digital maps of the Moon were from the US Clementine mission with a resolution of 200m. At its best, Smart-1 mapping reveals features 40m across. The resolution is not quite good enough to see individual pieces of Apollo equipment left on the Moon, but it is sufficient to allow the Smart team to compare its data with the surface photographs returned by the pioneering astronauts. "For example, we have correlated our data with the ground truth collected by Apollo 15. Our images are consistent with the panoramic images collected by the astronauts," said Professor Foing - adding, with a smile: "So, I believe they have been there!" Among its several firsts, Smart 1 has found peaks in the northern polar region that are always in sunlight. It has also been looking for depressions that are always in darkness - places where ice could yet be found. Both locations could be extremely useful to future manned missions, providing bases to set up solar power stations or to source water. "Smart 1 will now rest in peace on the Moon," said Professor Foing. "We are now collaborating with the international community, preparing the way for the future exploration of the Moon - the next fleet of orbiters, landers; leading to robotic villages and human bases." 1. Xenon gas atoms are pumped into a cylindrical chamber, where they collide with electrons from the cathode. The electrons - which are negatively charged - knock electrons off the xenon atoms, creating xenon ions - which are positively charged. 2. Coils outside the chamber create a magnetic field, which causes electrons from the cathode to spiral and become trapped at the mouth of the chamber. 3. The build-up of negatively charged electrons at the mouth of the chamber attracts the positively charged ions, accelerating them out of the chamber. 4. The stream of accelerated ions leaving the chamber thrusts the spacecraft forward. Although the force is small, over time it creates great speed in the frictionless environment of space.